AS Monaco were beaten 3-1 at the Stadium de Toulouse in the early game of Ligue 1 matchday nine. Trejo and a brace from Braithwaite answered Valère Germain’s opener. 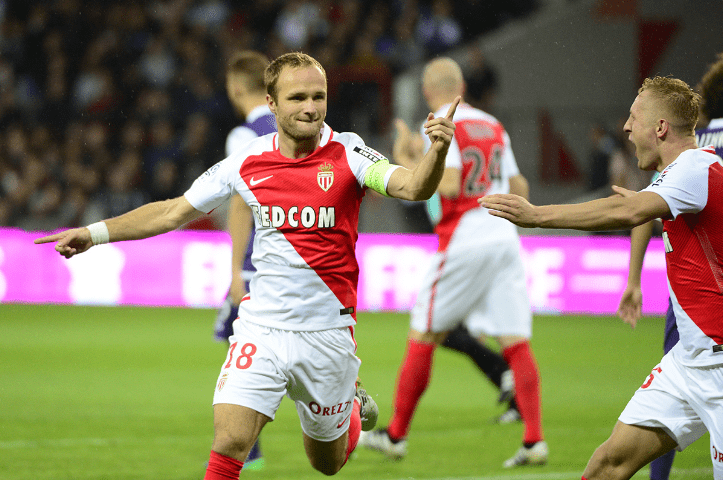 Toulouse FC – AS Monaco was one of the big clashes of matchday nine. The last time these two teams faced each other while both in the top five of Ligue one was on matchday five of the 1987/88 season. With just forty-seven seconds gone, Moutinho created a huge chance. The Portuguese midfielder seized on a first-time layoff from Carrillo and found himself all alone in the box, but sent his curling right-footed effort into the Toulouse sky. But the Red & Whites did make the breakthrough two minutes later. Boschilia delivered a sumptuous free-kick from 30 yards out wide on the right and found the head of Valère Germain, who nodded the ball into the corner of Lafont’s net to put the visitors 1-0 up. It was a superb goal for the Academy product, who was making his 100th appearance in Ligue 1 ! Toulouse had their first clear-cut opening of the game in the twelfth minute. After good work from Braithwaite, the ball found its way to Durmaz on the left, and although Subasic diverted his cross, Sylla arrived with a powerful header that the Monegasque ‘keeper managed to keep out to prevent the equaliser. Toulouse were dominating possession, but AS Monaco were looking to hit them on the break, with Boschilia and Silva using their pace to put the home defence under pressure. With 35 minutes gone, Silva overlapped down the right and looked to find his Brazilian teammate at the far post, but the ball was cleared by a Toulouse defender at the last moment. Leonardo Jardim’s men went in at the break with a 1-0 lead. The second half almost started in identical fashion to the first. After three minutes, Valère Germain won a free-kick that was taken by Boschilia, but the ball flew inches over the Toulouse bar. Alban Lafont hadn’t moved. The home side’s goalkeeper was in action again minutes later, his long clearance finding Sylla who moved the ball on for Braithwaite. It took some determined defending from Jemerson to deny the Danish striker. Toulouse were pushing hard and came close to an equaliser from a drilled cross by Durmaz. Fortunately nobody got a touch to the ball as it flashed across the face of Danijel Subasic’s goal. The home side began to rack up the chances and summoned up an equaliser just after the hour mark. From a left-wing cross, Braithwaite headed the ball down for Trejo on the far side to slide the ball into the net and make it 1-1. The Monegasques responded by sending on Sidibé, Lemar and Bakayoko. But although they seemed to have things under control, the Red & Whites were caught out twice by Martin Braithwaite (85 and 88 mins). The final score was 3-1, with AS Monaco going down to their second defeat of the season. They will have a chance to get things back on track on Tuesday against CSKA Moscow in the Champions League.